This year at Paris Fashion Week, Karl Lagerfeld at Chanel and Marc Jacobs at Louis Vuitton presented dainty collections in immaculately staged shows, as they usually do. But there's only one show that's still stuck in our heads—the performance art coup Rick Owens executed with help from four squads of lady steppers. 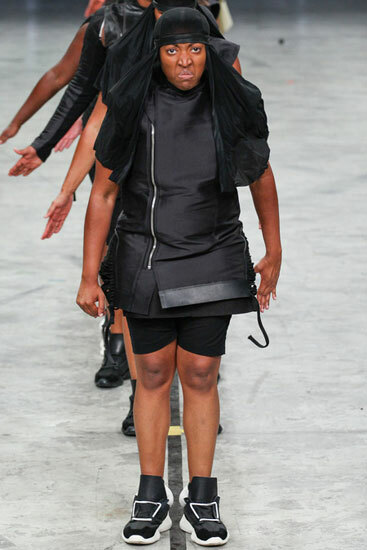 Comprised of students from colleges like Howard and the University of Maryland, the troupes danced in Owens' Spring 2014 clothes, presenting the collection in three-dimensional motion. We weren't the only ones mesmerized; the show sparked a lively debate on our site about black representation on the runway, the culture and politics of dance at Historically Black College and Universities and why, exactly, these ladies looked so pissed. Here, the show's choreographer LeeAnet Noble, also a dancer, singer and percussionist, sheds some light on Team Vicious' five-month journey to the Paris runway and how 40 lady steppers changed the course of Paris Fashion Week. How did you get involved with Rick Owens? Back in April, I got a call from Asha, a friend that produces Rick Owen’s fashion shows. She said that Rick had this idea to to present his collection, Vicious, on steppers versus models. He had seen footage of some sororities stepping with the grit face, all intense, and he thought that it was perfect for his collection. How did you cast the show? When Rick’s people first reached out to the sororities on their own, the response was, "You want us to do what?" People really didn't believe it. The college steppers thought it was too good to be true. I always collaborate with my mother, who's also in the arts, and I brought her onboard to help out. My mother and I had to work to make them believe that it was really happening. Rick actually came to America, for the first time in 15 years, to meet the girls, embrace them and let them know that it was real. For Team Vicious, I cast some Zetas from Howard University, where I graduated from. I grabbed a lot of Deltas from the University of Maryland to form the Washington Divas. 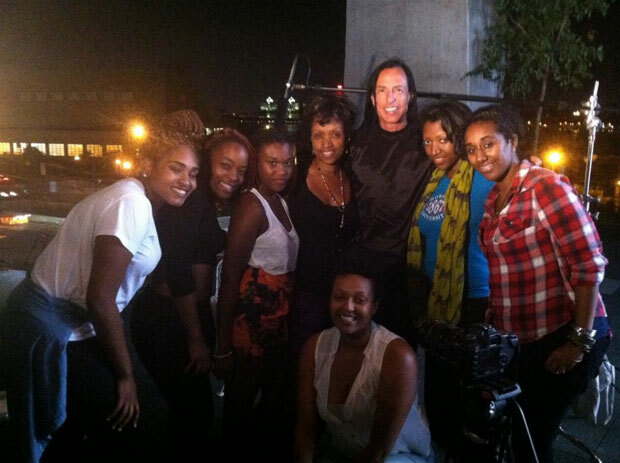 Then I also had two professional step teams that I had worked with before, Momentum and Soul Step. It was a little challenging—Rick had to have 10 women in each troupe, for each of the looks that he had lined up. Momentum only had six women in their team, so I recruited some professional steppers that I'd worked with previously and I also put myself in the group. We had to make it work. How did the teams rehearse? My mother and I went back and forth from New York to D.C. over a five month period to make sure that everyone knew the material. We recorded rehearsals and did video correspondences. We had to constantly send in videos to Rick and Asha to make sure that we were staying within the vision that they had. It was a lot. The teams that we worked with were used to doing their own things. I had to make changes to each team's routines, to make sure that it fit into the Vicious vision. Was it difficult wrangling the independent teams toward a single vision? It was easier than I thought it would be. I really did not want to have open auditions; I tried to go through referrals or people that I'd worked with before. With 40 women working in a space, if there are too many strong personalities, you aren't able to have a team environment. The easier portions were the entrances and performing as a whole, since that was material that I laid on them. That was an easier tackle than me coming in and changing something that a team had done before. Like saying: Now you have to grit. For instance, the Delta's from University of Maryland, they're used to smiling, looking cute and very dainty in all their pieces. So my mom had get in their faces and say, "Yeah, you have to grit and come harder." Whereas the Zetas, their whole thing is that they're used to the grit. We all had sessions of just gritting; we'd growl at each other just to get that in their system. "This was not a piece where it was time for smiles. We’re working, we’re coming hard, we’re intense and we’re strong." Where did that grit face aspect come from? It comes from the fraternities. The fraternities began stepping before there were sororities. So when the sororities came out way back when, they embodied what the men were doing into their sisterhood. Grit is like putting on your game face before you hit the field, all about coming hard and intimidation. Since stepping has a lot to do with competition, Rick's whole thing was that even thought we're working together as a whole, there would still this this vicious side to each of the troupes. Like a mini-competition between each team. Did you anticipate there'd be a backlash from sororities and black communities after the show? Not at all. I would think that the black community in particular would be familiar with the grit face. This is something that you see in the frat brothers and step competitions all the time. The Zetas, in all their normal routines, put on the grit face. So it is surprising that that would be the reaction in the black community. The reason that Rick was drawn toward stepping is because he thought it was so intense and its that same intensity that he wanted to come through. If we came out in those clothes—the intense black leather pieces, the draped dress and those shoes—smiling and being dainty, it wouldn't do justice to the collection that Rick made. And at the end of the day, it's a fashion show. It's about selling and drawing attention to the clothes. Were you aware of the Balance Diversity Coalition and their open letters, which called out the lack of diversity on runways? I wasn’t. I actually didn’t hear about them until after we did this performance, when people were saying that this was so timely. Rick had been working on this project for a while and it just happened that way. How did people respond after the show? What's very interesting to me is how much times have not changed. Back in the day, black artists used to have to go to Europe to be accepted and embraced for their art. From Josephine Baker to the Nicholas Brothers, they were all so loved when they performed in Europe. The reactions that we got from the Paris audience were tears, screams and yells. The audience had such high emotions and were so connected to the energy that we were bringing. I didn't expect people to be in tears. They felt like: this is art, we're not just witnessing another fashion show. It's just a small group, but to see the embrace that we got in Paris and to come back here and have people from our own community criticize is just like back then. I feel like 97% of the reviews we're getting here in America are wonderful, and then there's other that 3%. The day after the show in Paris, on all the papers there were pictures of models next to pictures of brown girls everywhere. After the show, one of our college girls couldn’t stop crying. She was like, "I can’t believe this is happening." She was so overwhelmed with emotion. The girls worked so hard on this. The final train in the show, I can’t even describe how much energy it took. I felt like I was carrying the whole group on my back after doing that performance. It was thrilling, but we put a lot of sweat into that piece. Since I was in the front of the train, it felt like we were all connected. We had Deltas locked in with AKAs locked in with Zetas locked in with non-Greek professional dancers. At one point one dancer was saying, "I’m locked in with an AKA and I’m a Delta, and I feel kind of funny about it.” I told her it’s not about what sorority you’re in, it’s about being connected as one in a sisterhood as women, working together and bringing that power. This was not a piece where it was time for smiles. We’re working, we’re coming hard, we’re intense and we’re strong. Each sorority has their own style of stepping. This whole project was about people stepping out of what they're used to. That's why people are saying its so groundbreaking, it's something the fashion world has never seen.